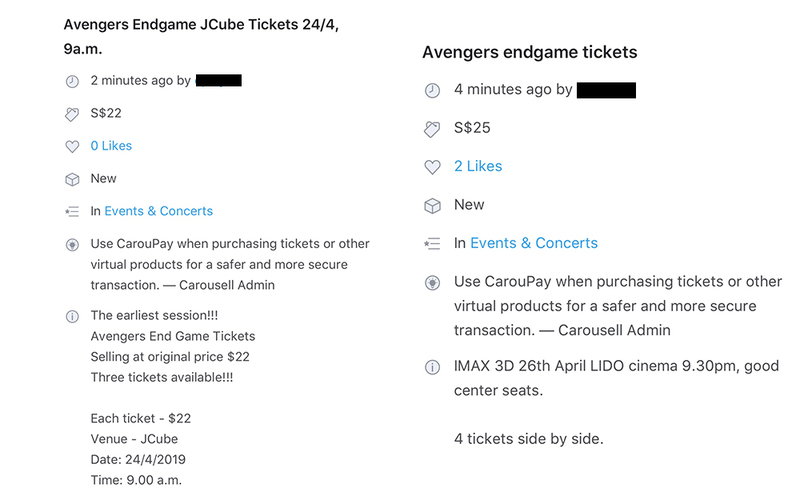 Avengers: Endgame advance tickets went on sale today at 9:30am, and in less than three hours, scalpers have already started making unbelievable listings on Carousell. Ranging anywhere from $50 to $500, everything we’ve seen seems to pretty random, spanning across cinemas all around Singapore. It’s almost as if people are selling whatever they could get their hands on, which makes sense considering that the online queue for Shaw’s website goes up to the ten thousands. 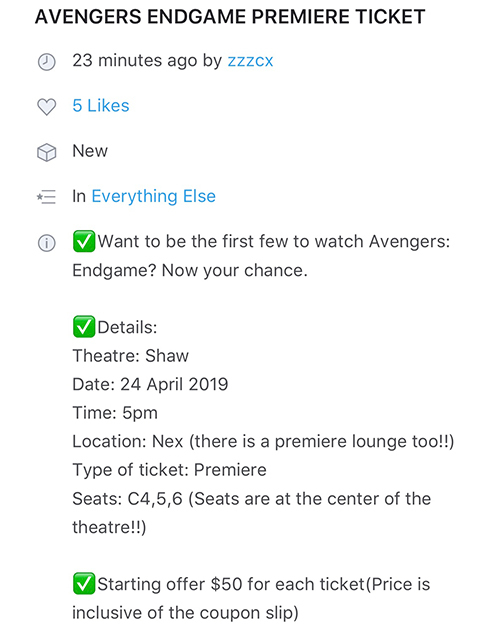 One particularly scummy listing, however, is this user selling a whopping 40 tickets (“friends couldn’t make it”, apparently). The description puts his/her rates at $120 for a pair of standard weekend tickets, while a pair of Gold Class tickets are going for $600. To put things in perspective, a Gold Class ticket usually costs $39. 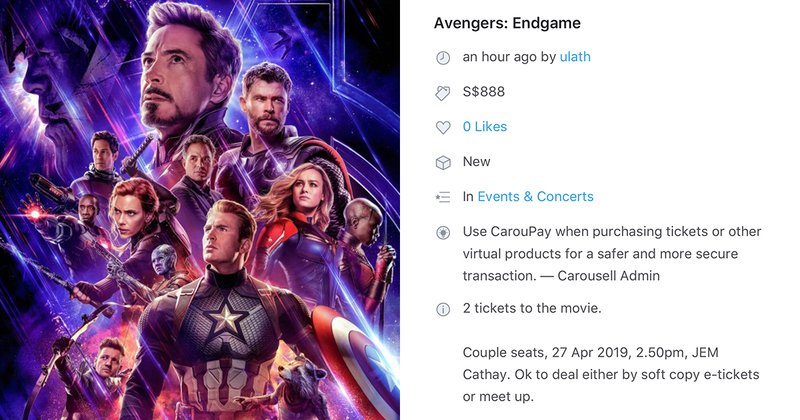 Surprisingly, not everyone is on Carousell to make a quick buck — there’s at least one user who’s selling their tickets at cost price. We’re not sure why someone would buy tickets at launch just to sell them right after, but our mothers told us not to look a gift horse in the mouth either. 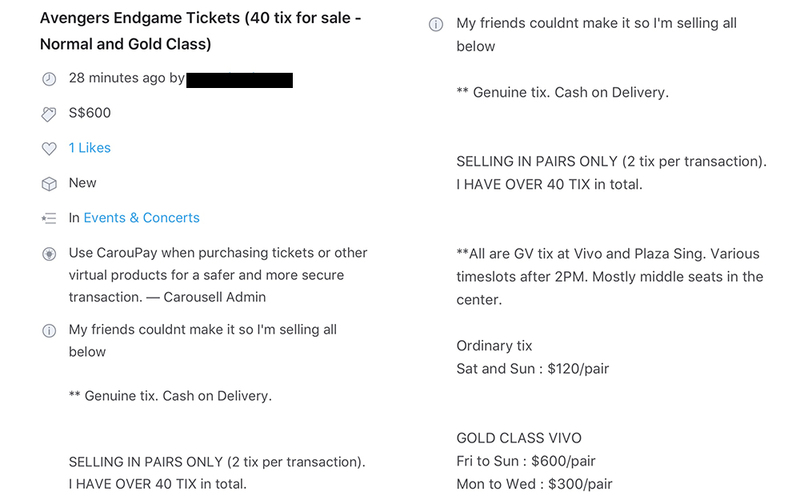 Of course, we shouldn’t be that surprised — resale tickets for Coldplay’s 2016 concert went all the way up to $6,200, and even balloted National Day tickets have a reputation of being sold on the online marketplace as well. 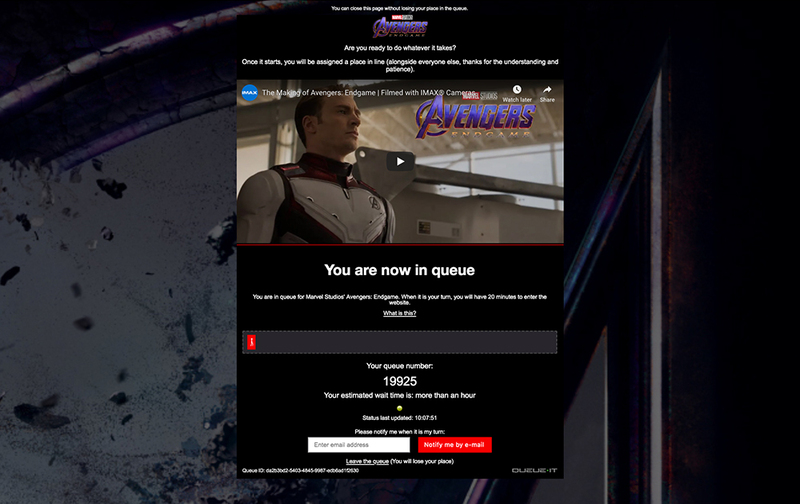 The main difference is that Avengers: Endgame is a movie that’ll probably have hundreds of screenings for at least a month (if not more), so if you can resist the #fomo and catch it a few days later this is one scam that you easily avoid. The hardest choices require the strongest wills, after all.